Marketing models have undergone constant development over the past 150 years. Before the emergence of the marketing orientation, there have been several eras of different views and concepts. To understand the evolution of marketing theory, we will investigate the individual evolutionary stages in more detail. The evolution of marketing theory starts with production orientation. Production orientation is the view that the route to corporate success lies in production efficiency, getting production costs as low as possible (usually by manufacturing in very large volume) in order to reduce costs and prices. This orientation had its beginnings at the start of the Industrial Revolution. Up until the nineteenth century, almost everything was hand-made and made to measure. Clothing was produced by tailors to almost exact measurements or was made at home, houses and vehicles were produced to customer specification, and relatively few items were standardized. Producing in this way is relatively expensive, consequently prices were high for most goods and people owned correspondingly fewer things. When machines were introduced to speed up the manufacturing process, costs dropped to perhaps one tenth of the cost of customized products, so that prices could also be cut provided enough goods could be sold. The longer the production run, the lower the costs and consequently the greater the profit: customers were prepared to accept items that were not exactly meeting their needs, since prices were a fraction of what they would have had to pay for the perfect, tailor-made article. For manufacturers, the key to success was therefore ever more efficient (and low-cost) production, but at the cost of meeting individual customers’ needs. Production orientation still survives in some markets, notably those where most people do not already own the core benefits of the products concerned. Until recently production orientation was the prevailing manufacturing paradigm in Communist countries, but this is now being replaced by a more market-oriented approach. The second stage in the evolution of marketing theory is product orientation. Product orientation is the view that an ideal product can be produced that will have all the features any potential customer might want. This orientation is thought to be a result of oversupply of basic goods. Once everyone already owned the core benefits of the products concerned, manufacturers needed to provide something different in order to find new customers. Products with more features, made to a higher standard, began to be introduced. By the late nineteenth century extravagant claims were being made for products on the basis of their quality and features. Manufacturers sought to resolve the problem of diverse customer need by adding in every possible feature. The drawback of this approach is that the price of the product increases dramatically, and customers are not always prepared to pay for features they will never use. The difficulty with both production orientation and product orientation is that they do not allow for the different needs and circumstances of consumers. Customers differ from each other in terms of their needs – there is no such thing as ‘the customer’. 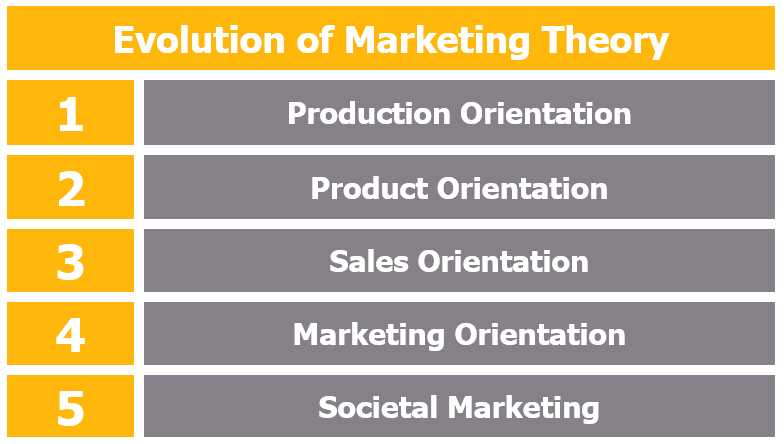 Moving on, we can identify the next stage in the evolution of marketing theory as sales orientation. This concept is based on the idea that manufacturing companies can produce far more goods than the market can accept. Sales-oriented companies assume that people do not want to buy goods, and will not do so unless they are persuaded to do so: such companies concentrate on the needs of the seller rather than the needs of the buyer. Sales orientation relies on several assumptions: first, that customers do not really want to spend their money: second, that they must be persuaded by the use of hard-hitting sales techniques: third, that they will not mind being persuaded and will be happy for the salesperson to call again and persuade them some more: and fourth, that success comes through using aggressive promotional techniques. Sales orientation is still fairly common, especially in firms selling unsought goods such as home improvements and insurance, and often results in short-term gains. In the longer term, customers will judge the company on the quality of its products and after-sales service, and (ultimately) on value for money. Sales orientation should not be con- fused with the practice of personal selling: successful salespeople do not operate on the basis of persuasion, but rather on the basis of identifying and meeting individual customers’ needs. The most common view today in marketing theory is marketing orientation. Marketing orientation means being driven by customer needs: this is sometimes also called customer orientation. Companies that are truly marketing oriented will always start with the customer’s needs, whatever the business problem. Customers can be grouped according to their different needs, and a slightly different product offered to each group. This type of differentiation allows the company to provide for the needs of a larger group in total, because each target segment of the market is able to satisfy its needs through purchase of one or other of the company’s products. The underlying assumption of marketing orientation is that customers want to satisfy their needs, and will be willing to buy products that do so. Customer need includes a need for information about the products, advice about product usage, availability of products and so forth. Customer need therefore goes beyond the basic core benefits of the product itself. Marketing orientation also implies that customer needs are the driving force throughout the organization. Decisions within the organization, in every department from manufacture through to delivery, need to be taken in consideration of customer needs at every stage. Quality control in the factory, accurate information given by telephonists and receptionists, and courteous deliveries by drivers all play a part in delivering customer value. Three components can be identified to determine the degree to which a company is marketing-orientated: competitor orientation, customer orientation and inter-functional co-ordination. The very last and most recent stage in the evolution of marketing theory is societal marketing. Societal marketing includes the concept that companies have a responsibility for the needs of society as a whole, so should include environmental impact and the impact of their products on non-users. Societal marketers believe that sustainability is a key issue since it is of no help to the long-term survival of the firm if natural resources are used too quickly. Long-term results of use of the product are also considered, in terms of their impact on the environment. For example, a car manufacturer might aim to make cars quieter in operation rather than simply improving the soundproofing for its occupants and ignoring the needs of people who live near major roads. Being able to differentiate the various views that have been developed over time in the long evolution of marketing theory helps to get a clearer idea of how marketing can be interpreted.